QuadTech Guardian 6200 ( Guardian 6000 ) Production Safety Analyzer with option 6000-04 Line Leakage Scan unit. All-in one AC/DC Hipot, Insulation Resistance, Ground Bond, Current Draw and Power Consumption measurements. The Guardian 6200 is designed for fast, easy, production testing of electrical products such as blenders, fans, and other small appliances in accordance with UL, CSA, and IEC standards. 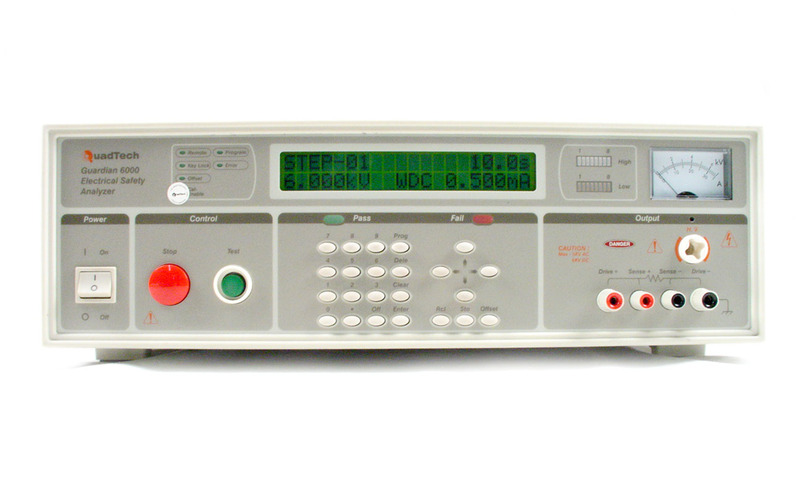 Without changing the connection to the product, the tester is able to perform all the essential electrical safety tests in one unit, including AC/DC Hipot, Insulation Resistance, Ground Bond, Current Draw and Power Consumption measurements. Performing all these tests in one box increases production by reducing test time and eliminating multiple test stations. AC Hipot Test Performs AC dielectric testing (hipot) over the voltage range from 50 to 5000VAC RMS. Leakage current detection is programmable from 1µA to 40mA, making the 6200 ideal for testing medical products and instruments having a wide range of leakage currents. DC Hipot Test DC dielectric testing is possible from 50 to 6000VDC with leakage current detection down tot 0.1 µA. The maximum total output current of 20mA allows quick charging of capacitive devices and products. Insulation Resistance The insulation resistance test (similar to DC Hipot) calculates and displays a product’s insulation resistance value in ohms. This resistance can be measured over the range of 100kW to 50GW with test voltage programmable from 50 to 1000VDC. Ground Bond The ground bond test, sometimes referred to as a high current continuity test, can be programmed from 1 to 30A for verifying the integrity of a product’s ground system. Resistance measurements are displayed and a high limit programmable between 0.1mW and 510mW. Power Monitoring/Functional The 6200 can monitor voltage across, current draw, or power consumption of the product under test. This electrical safety test. Additionally, for compliance testing of electrical products, the analyzer can perform line/earth leakage tests in four possible configurations, five human body models, with programmable limits from 0.1 µA to 9.999mA. Note: This test requires input isolation transformer for proper operation. Chroma A190314 Chroma A190314 Quadtech G32 1000VA Isolation Transformer.